Fresh fruit or some crisp cool crunchy veggies on a hot summer’s day. Sure they are available year-round, but during other seasons they are coming from thousands of miles away. How fresh do you feel after long-distance travel? I know after a whole day of flying I’m worn out. Not to mention, mom says in-season fruits and vegetables are usually good for our family budget. Dill, basil, copious amounts of berries like blackberries, strawberries, boysenberries, raspberries, grapes and my F-A-V-O-R-I-T-E blueberries (that’s what makes me so smart! ); veggies like corn, cucumbers, green beans, green peas, summer squash and tomatoes; fruits such as mission figs, cherries, kiwi, watermelon and other melons, stone fruits like nectarines, peaches, plums, and apricots. With so many fresh choices you’ll just make it through the list by fall! Herbs like basil and dill are perfect additions to summer fresh produce. It’s a good time to plant an herb garden with some starter plants. Cucumber and dill, tomatoes and basil are examples of essential pairs that liven up a summer meal. Basil and dill contain flavonoids which can protect cells from damage. Traditionally these herbs have been used for their soothing properties –but they add a lot of flavors too. When selecting the herbs look for a vibrant green color with no yellowing –that means they’re fresh. I love pulling out the chives, parsley, and dill from our herb garden when mom starts cooking. Red Tomatoes are very popular and have health benefits in all of their colors, different shapes, sizes, and forms. From fresh to stewed tomatoes they add a kick to any salad or soup. My favorite tomatoes are the little cherry tomatoes because they’re so cute, tasty and easy to eat! I bring them along for picnics and play- dates. Tomatoes are a great source of vitamins and phytonutrients like lycopene (like-o-peen). Lycopene makes the tomato its brilliant color red– plus it works as an antioxidant, that fights cancer and may play a role in the prevention of heart disease. Look for an overall bright color and slight softness when selecting this powerful super-yummy food. Kiwi can be blended in a smoothie, added with strawberries on yogurt, or tossed into a salad. One kiwi fruit has more vitamin C than an orange. 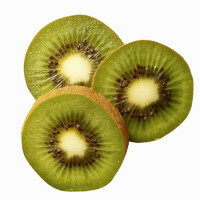 Kiwi are also a good source of vitamin E which can usually only be found in nuts and oils. This fuzzy fruit is jam-packed with health-promoting nutrients. One point to remember when selecting a kiwi is the firmer the fruit the tarter the flavor. My mom cuts them in half so she can easily scoop it out with a tablespoon for me to eat. Visit your local farmer’s market–Don’t be shy give them a try. It’s an adventure!